Lines drawn on paper may have catastrophic consequences in the real world. This seems to be the message and premise of Begum Jaan, a film about a fictional brothel sliced in half by the line dividing India and Pakistan. This could also - tragically - serve as a warning that should have been extended to the makers and writers of this film, for too much has obviously been lost on the way from intent to execution. National Award winning Bengali director Srijit Mukherjee makes his Hindi language debut with this remake of his own Rajkahini, and it turns out to be an odd choice of film. 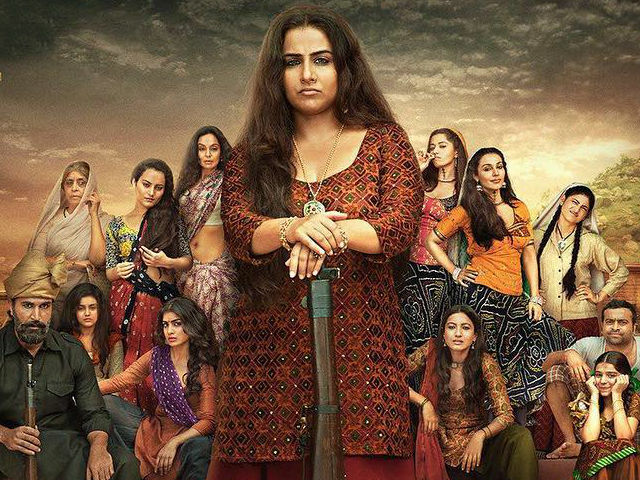 Begum Jaan is a highly melodramatic film that waxes frequently on how Hindus and Muslims are the same beasts, but - at its core, under all the shrillness - it is a frustratingly straightforward film about an eviction being carried out. The brothel is run by the titular Begum Jaan, played like a banshee by the usually wonderful Vidya Balan. It is devastating to watch an actress of Balan's caliber turned into this kind of caricature, a woman who starts off like an angry Kirron Kher and ends up going gale force Rakhee. It is also mystifying why she would want to run a brothel, given the way Begum constantly complains about her life and her lot. Considering how she speaks exclusively in platitudes, she could have had a fine career painting silly idioms onto the backs of bullock carts. Nearly every line in this film, in fact, is delivered in tremendously wooden and stilted fashion, making me speculate that it was a film written in English, thought through perhaps in Bengali and then translated, sloppily, into a mix of Hindi, Punjabi and Urdu. The result sounds like a bad street play, with characters sounding like they've been dubbed even when they haven't. Sometimes they are dubbed, and awfully so. Pitobash Tripathy, for example, who plays Begum's lackey Surjeet, clowns around to amuse the resident prostitutes with animal sounds. This tomfoolery is done horribly, with sounds of actual animals and people pasted onto the lipsyncing actor instead of letting him go full Police Academy. And when characters are actually talking, when actors like Balan and Naseeruddin Shah are elevating the material and making the words sound intriguing or sinister, the background score plays spoilsport and frantic shehnaai is thrown in. At other times the weather itself serves as punctuation, with squalls of rain around to wetly underline Balan's more mad-eyed declarations. The fact that people are standing around bone dry in her courtyard both before and after a rainstorm doesn't seem to matter. Just like the fact that the partition took place in August yet our Angry Indian Prostitutes play Holi soon after. Ah, the partition. "At the stroke of the midnight hour," we hear Jawaharlal Nehru's voice boom from a radio as the women of the brothel gather around to dreamily listen. It is a disturbing, telling shot. The radio is in the foreground and the women are looking at it, rapt, disbelieving, somewhat confused. This last bit may be the truest thing in the film, since they are looking, in point of fact, at the back of the radio which faces no one - but the camera. Begum Jaan is, thus, immensely hard to take seriously. A character portends her death by literally kicking a bucket, and I kept wondering if another character, named Salim, would eventually be crippled simply because of his name. (He is.) During the scenes of displacement, the weight of partition is expressed by a big tall Sikh bent over under a single little suitcase he carries on his shoulder. Representatives of India and Pakistan are shown to us with half their faces on screen, as if even aspect ratio is now taking sides. The main plot doesn't make sense, since a routine eviction - at gunpoint, at most - that could have been carried out by the authorities, is handed over to a madman so he can wreak utter (and inane) havoc. Much could have been salvaged had the women of the brothel been fascinating, but none are given the sprawl to really do much of anything. Gauahar Khan is effectively bold when telling her lover about her body and how little it matters in the grand scheme of things, Pallavi Sharda does well as a girl with brothel-escaping dreams, but nothing here is particularly interesting, and nearly every accent is murder. Two lesbians appear briefly intriguing, but the camera - so keen to shock throughout this film - shies away from their affection, choosing to show us Vivek Mushran getting kissed instead. 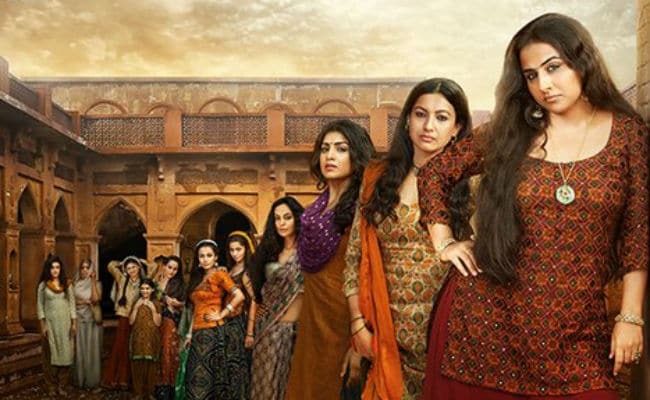 Begum Jaan could well have been a film about a fantastic bunch of feisty, disparate women taking on all odds, but alas. We're left only with memories of some melancholy bores.